Author(s): Xunyu Xiong, Xinfeng Zhao, Yajuan Li, Zhenghua Song. Key Laboratory of Synthetic and Natural Functional Molecule Chemistry of Ministry of Education, College of Chemistry and Materials Science, Northwest University, Xi’an, 710069, P. R. China. We have developed an efficient method for fast determination and pharmacokinetic study of paclitaxel in rat plasma. 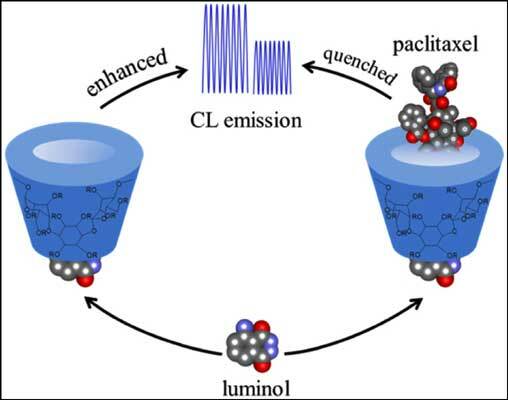 The method involved a flow-injection chemiluminescence (FI-CL) technique that depends on the inhibition of a luminol/ sulfobutylether-β-cyclodextrin (SBE-β-CD) – chemiluminescence (CL) reaction system by paclitaxel. A linear relationship was found between the loss of CL and the quantities of paclitaxel with an equation of ΔI = (37.9±2.4) lnC + (127.6±5.2), allowing sensitive and fast determination of paclitaxel with a detection limit of 0.2 ng/mL (3σ) and relative standard deviations (RSDs) less than 4.0%. One assay’s recycle including sampling and washing procedure was accomplished in 36 s, providing a sample throughput of 100 h−1 under the optimum experimental conditions. Although the pharmacokinetic profiles of paclitaxel and its inclusion complex all accorded with one compartment open model, the area under the curve of paclitaxel from time zero to last sampling time (AUC0-t) was increased from 71.4±5.24 μg·h/mL to 96.7±4.62 μg·h/mL, whereby the absorption of paclitaxel was enhanced 1.35 folds through inclusion of SBE-β-CD. The proposed method has the potential to become a powerful alternative for pharmacokinetic study of paclitaxel due to the advantages of good linear range, high sensitivity and recovery as well as superior analytical efficiency. Keywords: Paclitaxel, pharmacokinetic, sulfobutylether-β-cyclodextrin, chemiluminescence, flow injection, plasma. Affiliation:Key Laboratory of Synthetic and Natural Functional Molecule Chemistry of Ministry of Education, College of Chemistry and Materials Science, Northwest University, Xi’an, 710069, P. R. China. Keywords:Paclitaxel, pharmacokinetic, sulfobutylether-β-cyclodextrin, chemiluminescence, flow injection, plasma. Abstract:We have developed an efficient method for fast determination and pharmacokinetic study of paclitaxel in rat plasma. The method involved a flow-injection chemiluminescence (FI-CL) technique that depends on the inhibition of a luminol/ sulfobutylether-β-cyclodextrin (SBE-β-CD) – chemiluminescence (CL) reaction system by paclitaxel. A linear relationship was found between the loss of CL and the quantities of paclitaxel with an equation of ΔI = (37.9±2.4) lnC + (127.6±5.2), allowing sensitive and fast determination of paclitaxel with a detection limit of 0.2 ng/mL (3σ) and relative standard deviations (RSDs) less than 4.0%. One assay’s recycle including sampling and washing procedure was accomplished in 36 s, providing a sample throughput of 100 h−1 under the optimum experimental conditions. Although the pharmacokinetic profiles of paclitaxel and its inclusion complex all accorded with one compartment open model, the area under the curve of paclitaxel from time zero to last sampling time (AUC0-t) was increased from 71.4±5.24 μg·h/mL to 96.7±4.62 μg·h/mL, whereby the absorption of paclitaxel was enhanced 1.35 folds through inclusion of SBE-β-CD. The proposed method has the potential to become a powerful alternative for pharmacokinetic study of paclitaxel due to the advantages of good linear range, high sensitivity and recovery as well as superior analytical efficiency.